What made up simulations were that where the CV90 has won against Attack Helicopters? Any vehicle without dedicated Anti Aircraft role is in a huge disadvantage against CAS aircrafts, especially when it has no armor nor any weaponary such as CV-9040. NATO did dare sending Apaches into Serbia, 7 were destroyed after that they recalled that tactics. There are still parts of Apache equipment in Belgrade Museum along with pictures of destroyed equipment and scrap metal left of crash sides. The combat was between CV9040 AA version against Bo 105P/PAH-1A1, Three vs Three. Three times, and every time the helis were brought down Before they could find and engage CV9040. No armour nor any weaponry?? 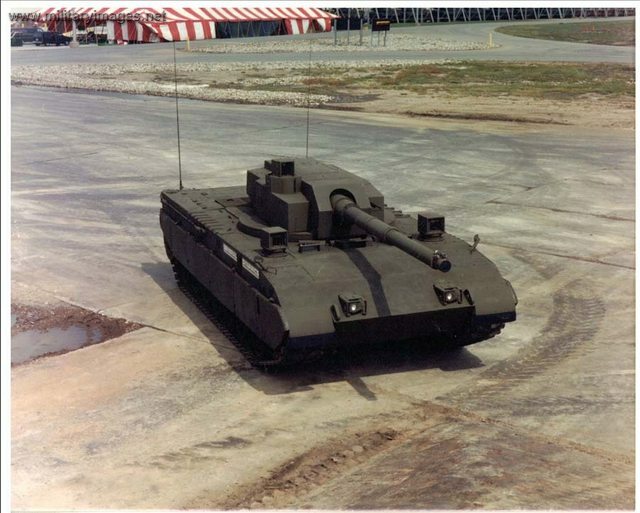 9040: Anti-Air Vehicle, fitted with PS-95 radar from Thomson CSF Harfang (now Thales Group) and a high elevation 40 mm autocannon capable of using programmable ammunition. Also connected to the national air defence net LuLIS. Three have been upgraded to C-standard. 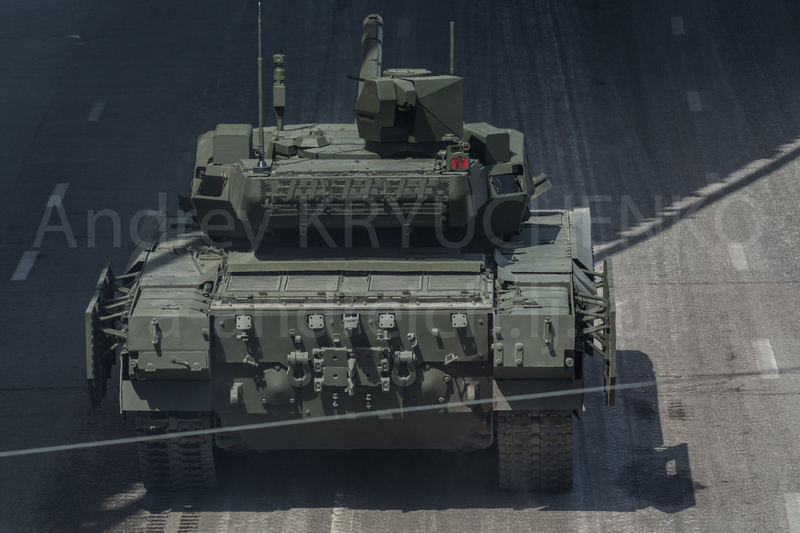 There is also a demonstrator designated Lvkv 90-TD fitted with infrared video targeting and fully stabilized gun for firing on the move. The basic armour of the CV9040 provides all-round protection against 14.5 mm armour-piercing rounds. Armour protection over the frontal arc is classified, but all models from CV9040B and later are said to be protected against 30 mm APFSDS. Some variants, including the CV9030N, can be fitted with MEXAS, a ceramic appliqué armor which provides all-round protection against 30 mm APFSDS. Bo-105 are not worth even speaking about a single 20mm HE-Frag round to the cockpit will destroy it and anyone sitting in it. Obviously it will be not the same against Attack Helicopters with dedicated modern ATGM's and not wire guided TOW's which forces helicopter to hover. 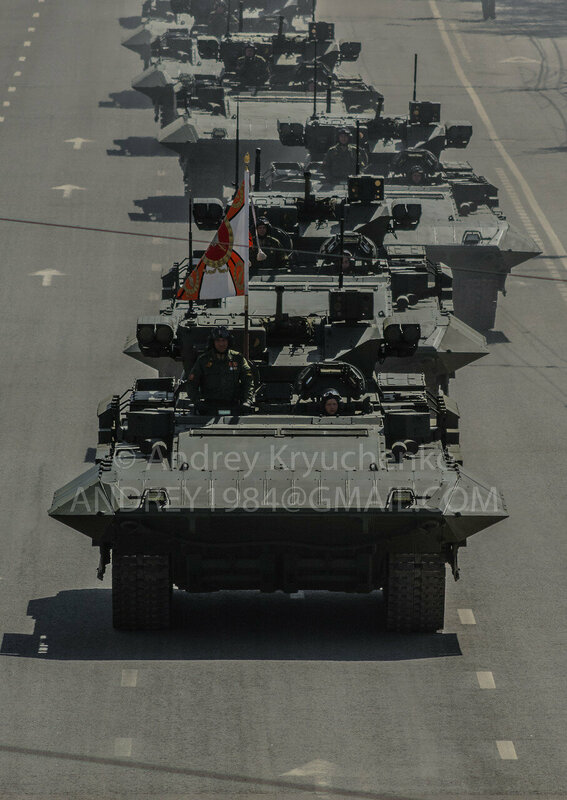 Gur Khan is implying Armata is using active suspension. What do You think, will Armata revive M1 TTB project? 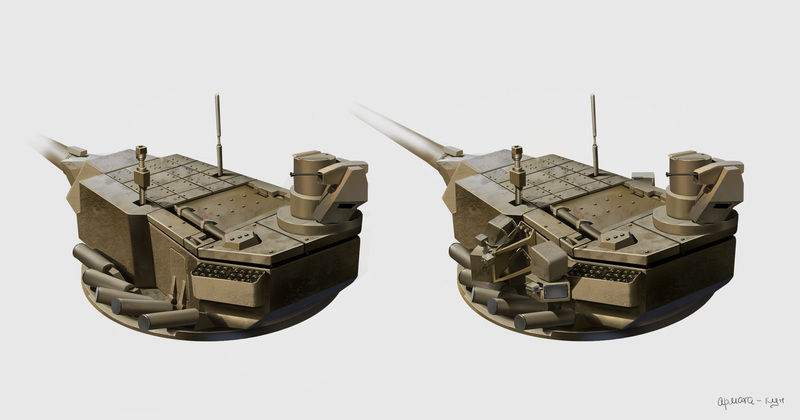 they could, but the end result would be like T-14 turret mated to modified T-90 chassis used as base for Koalition. not optimum, and would always be inferior to a clean slate design with unmanned turret in mind from the get go. I wonder. Anyway TTB was nothing but a test. 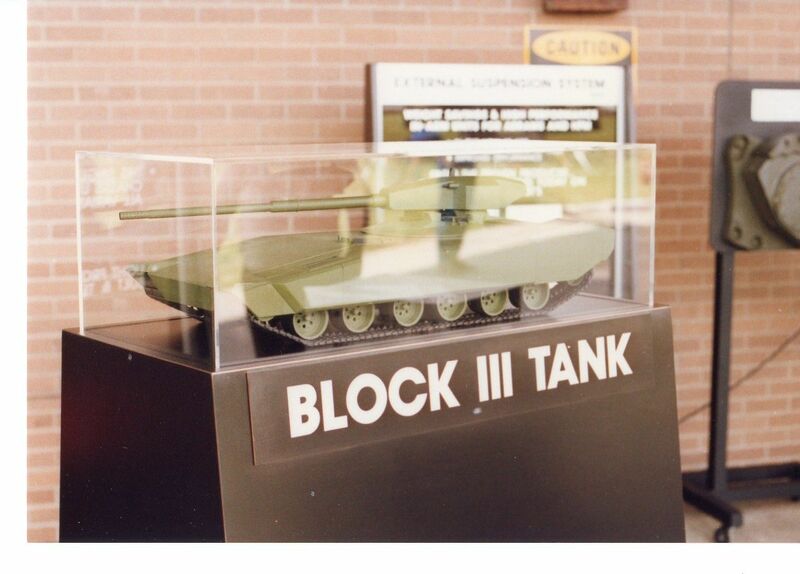 US want to go on something look better, the "Tank Block III"
Anyway given that there's still strong "conservatism" within the US. I think they won't go as far as putting the whole crews in hull. The "M1A3" Will either upgraded M1A2 or a new tank but retain crew in turret configuration. 1 things for sure tho- gotta love the mental gymnastics the murifat crew would use to justify their double think. T-72B3 is a cheap upgrade, and I wouldn't be surprised if the T-72B4 was a more expensive yet rather more capable upgrade. What if it turns out looking a lot like the T-90MS upgrade lol? The T-72 has nearly reached the limit of upgrades, B3 will be enough for now. Look at the T-64, "Bulat", high cost upgrade that dont make any big difference. Its outclassed in Donetsk and dont stand up to the standards of a modern tank. 1.) It was specifically concerning the Algerian T-72 inventory, what makes you think we're talking about Russia's inventory of armor? Did you miss the part of me quoting Cyberspec's post speaking about Algeria's T-72's? 2.) 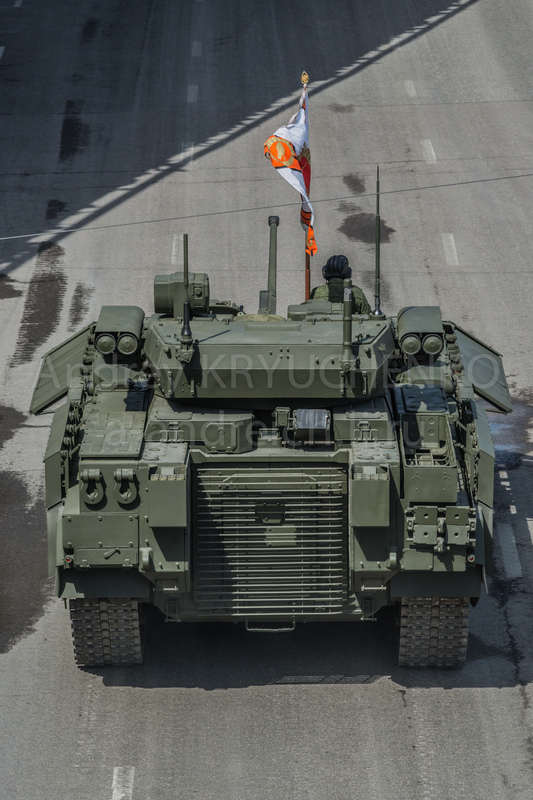 Armata platform won't be exported until the 2020's, so its rather pointless to bring up the T-14 because Algerians won't be owning any until 5+ years from. It's the Algerian military's money, if they want to upgrade their T-72's, then it's totally up to them. Clearly the upgrades were centered/offered towards the export market...I thought it was fairly obvious? 3.) Comparing Ukrainan half-assed upgrades with Russian full-assed upgrades...seriously? Don't you know there are at least 80 russian tank divisions consisting of one armed tankists. What they do with all that cut off arms? From Otvaga I suspect, but what is it? - A stripped down T-14 turret? - Another potential turret configuration? - T-14 fitted with a 152 mm gun? O.K., that was my first suspicion...but I got a question, it looks like those panels on top of the turret are ERA, so is it a turret with just the top-attack ERA left on top? My belief is that there is no ERA on the sides of turret, even though it's not a popular opinion to hold. Many top-attack weapons rely on downward looking EFP warheads, which ERA is still effective against. It's a hurdle to make top attack weapons with tandem warheads, and it's even harder to make such weapons with command guidance. Most rely on seekers, and seekers are vulnerable to countermeasures. Of course, the turrets may have vertically aligned ERA on the side of the turret, which would be really hard to see under the shell, instead of the horizontally aligned ERA we're used to seeing. You are not the only one that thinks that is exactly how the turret looks beneath that metal casing, but i have to say one thing about this artwork. The guy who drew this picture has leveled the ERA tiles right on the same level as the metal plate of the turret side. IMO the ERA is mounted on to an armor plate that would mean the ERA tiles should be a bit higher than the turret side armor of this Artwork, otherwise that would mean the ERA is just the only top armor there is without an RHA plate beneath it just open air to the turret interior. By awesome paralay's forum guys. alexZam wrote: By awesome paralay's forum guys. This turret is obviously too narrow. All these smarmy plots based on groundless assumptions are a bit silly. how much of the speculated and rendered equipment it is supposedly covering. Regular wrote: What do You think, will Armata revive M1 TTB project? nah, not really worth the trouble to go for unmanned turret, not when the entire tank won't be optimized around it to begin with. diesel engine is the big one, and some kind of APS is the next. a gun upgrade like T-14's would probably be the next big item, but not as sure that will happen. if anything, some sort of setup to allow GLATGM (stored in turret bustle?) might allow an upgrade in offense... or just upgrades to propellant/projectiles. IMHO it's likely for T-90, Algeria is already bought in and supposed to be producing more locally, the question would be negotiating what package to get with those. The difference here in speed is Mach 2.5 vs Svir/Reflex of 400 m/s it has like you have mentioned a high initial velocity but only for around 1km just like Helicopter ATGM's while MANPADS tend to sustain above Mach 2 speed. What makes you think a helo could evade either? and such ideas of using MANPADS on tanks have been thrown around before. Generally thrown around and rejected... Most tanks will never see the missile from the helicopter that hits them let alone the helicopter. With modern net centric systems if a tank spots a helo it makes rather more sense for them to mark it on their map and let the air defence forces deal with it. So in reality such MANPADS would have their use. Either spend 60.000 Euro on a MANPAD or waste 8 mln euro for a tank getting destroyed due the inbalance of tank vs helicopter and their respective capabilities against each other. I am not disagreeing with the concept that the tanks need protection from aircraft... my problem with your solution is that the solution already exists and will likely already be standard ammo... plus with every tank there will be a heavy IFV which will carry troops armed with MANPADs already... and that does not even allow for Air defence vehicles operating with the unit... there will be no shortage of anti aircraft weapons... especially if they manage to develop a guided 45mm or 57mm shell for their IFVs. The hole at the side is for rearming the autoloader, one reaches rounds through that hatch and another places them into the autoloader to load the carousel. the rear turret bustle likely holds ready to load rounds for ramming into the breach.... I would say a door opening above that would be ideal for loading that loader which could then feed rounds down into the lower turret autoloader rather more easily and more rapidly. 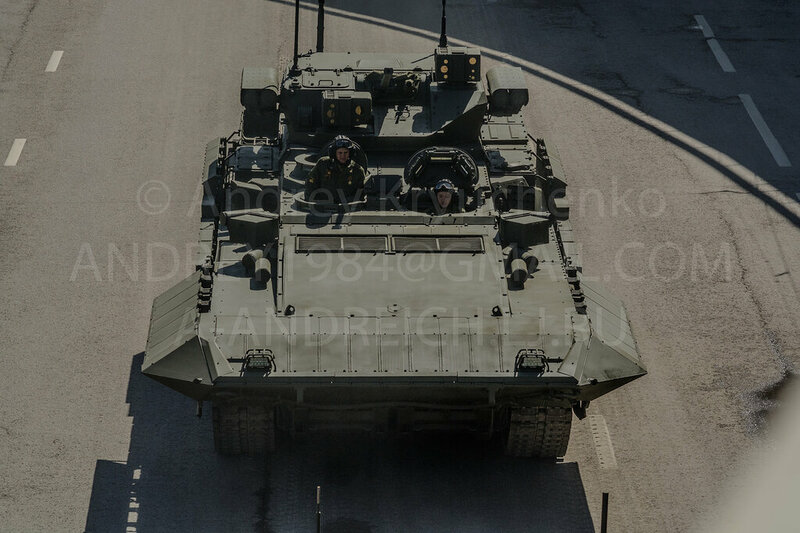 The thermal imagers on armata will be as good if not better than any fitted to a modern attack helo and it is far easier to spot a flying target than one on the ground. Even just passive radar sensors to detect MMW radar emissions will help the armata detect a helicopter at extended ranges. Why not assume they turn off their APS as well and perhaps leave all that extra modular armour at home... why would they not fit their brand new expensive tanks with Nakidka? The chances that the tank spots the helicopter first is unlikely and even if he does he is still not in the advantage over an Attack Helicopter. With the T-14 tracking the chopper and relaying with MANPAD team or AAA team on truck. Nakidka means Javelin wont get an autonomous lock so has to be manually guided and has no top attack capability. APS should be able to engage top attack weapons... so there you have two layers at least. Think of it in terms of critical and non critical systems... put critical systems... crew, ammo, fuel behind heavy protection... ie the hull... and move non critical systems and components into the turret... and duplicate them so that one hit wont take out the tank operationally. Versions of the well-known tank gun 2A46M were until recently main domestic gun. The latest modifications 2A46M-5 has the accuracy of firing 15-20% higher, the total rassevaniye when firing from the course decreased by 1,7 times. Thanks to completions the tool gained ability of a message firing by new armor-piercing and subcaliber shells of the increased power. The best western tool the 120-mm smooth-bore gun of L 55 with a trunk 55 calibers long of the Leopard-2А6 tank is considered now. In comparison with an old 120-mm smooth-bore gun L-44, length of a trunk of L-55 is increased by 130 cm. The shells of DM-53 and DM-63 applied on this gun have very high characteristics on a broneprobivayemost. And it in spite of the fact that unlike the American ammunition Germans don't use the grown poor uranium as core material. Certainly, at creation of the Russian main fighting tank on the basis of the heavy unified platform much attention was paid to providing high characteristics on fire power. In the 2000th years in Russia the new tank 125-mm gun 2A82 was created. To fall of 2006 from model and two prototypes at "Plant No. 9" managed to make respectively 787, 613 and 554 shots. The system with the autofastened and partially chromeplated trunk is capable to shoot as existing, and perspective ammunition. It surpasses all existing tank guns in a technological level by 1,2-1,25 times. Dulny energy of a gun 2A82 by 1,17 times surpasses the best NATO tool - 120-mm system of the Leopard-2А6 tank, thus length of a pipe of our tool is 60 cm shorter. Fastening the tsapfennykh of holders in a tower is entered by the return wedge. The back support of retractable parts is placed in oboymenny part of a cradle. The mouth of a cradle is extended on 160 mm. In a mouth of a cradle which rigidity is increased, are placed two additional the lyuftovybirayushchikh of the device. Both directing cradles are executed as a prism. The specified actions allowed to reduce average technical dispersion on all types of shells by 15% against tabular values. The gun 2A82 for "Armata" was decided to be modernized, having extended a trunk on the whole meter - to 7m. For the automatic accounting of a bend of the channel of a trunk on dulny part of a pipe of a trunk fastening of a reflector of the device of the accounting of a bend (DAB) is provided. The digital processing of signals accepted in the device provides measurement of necessary parameters of a trunk in the wide range of interfering and operational influences. The obtained data are issued as the amendment in the ballistic calculator that provides increase of accuracy of firing. Under this tool also AZ obmetaniye contour was altered. However it not strongly differs from the standard. New ammunition of BPS "Vakuum-1" by length 900mm was developed for a new gun 2A82. New "Vest" with blasting on a trajectory and URS 3UBK21 "Sprinter" also was developed for the 82nd gun. Further modernization and guns and ammunition is already planned. Germans on the basis of Rh120L55 do an electrothermochemical gun (such is throwing type). On the same way also we very much walk quickly. Within NIR with very speaking names "Lefthander" and "Levsha-M" the first experiments on the ETH-throwing were made. They yielded positive results. The decision to develop this direction is already made using the existing gun of type 2A82. 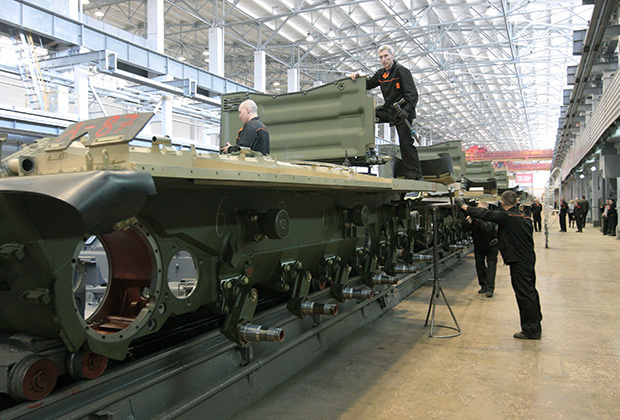 New ammunition for tools 2A82 of the T-14 tank of "Armat" successfully passed state tests in the 2013th year and is accepted on supply. Their mass production, the first party is begun in is accepted by representatives of the Ministry of Defence in the 2013th year and sent to arsenals for formation of standard stocks. 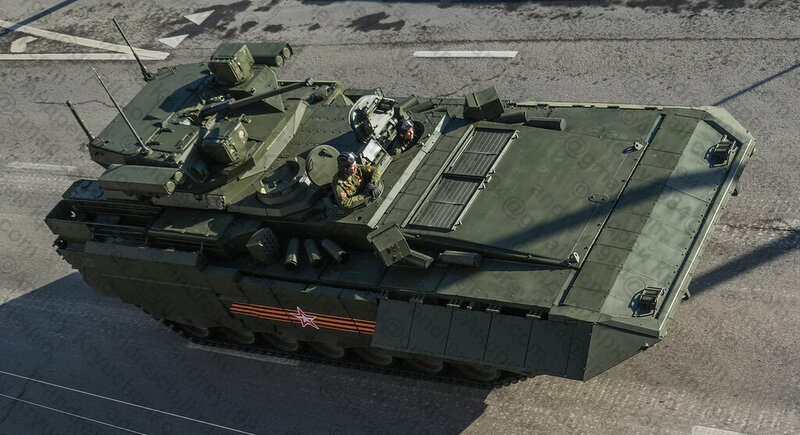 By the time of statement on arms of the main tank of Armata family will be created as standard stocks of ammunition, and the current requirement on combat training is provided. Production of guns 2A82 goes at full speed at "Plant No. 9" in Yekaterinburg. Gee collegeboy, that's a lot to chew on and I'm short on time today...basically the T-14's gun is more powerful than the Leopard's gun even though it's 60cm shorter and the new ammo has already passed tests and is in production...sounds good. do you have the original link? Zivo wrote: My belief is that there is no ERA on the sides of turret, even though it's not a popular opinion to hold. We don't know for sure, but Basil Fofanov (one of the mods at Otvaga) is of the oppinion that the turret is not heavily armoured. He says it has allround protection against 30mm AP rounds and against various top attack munitions. He says it was done to save on weight and believes it was the right choice since it's unmanned ....apparently, one of the reasons for abandoning the T-95 was because it's weight was approaching 60t. Werewolf wrote: You are not the only one that thinks that is exactly how the turret looks beneath that metal casing, but i have to say one thing about this artwork. The guy who drew this picture has leveled the ERA tiles right on the same level as the metal plate of the turret side. IMO the ERA is mounted on to an armor plate that would mean the ERA tiles should be a bit higher than the turret side armor of this Artwork, otherwise that would mean the ERA is just the only top armor there is without an RHA plate beneath it just open air to the turret interior. Complex SPM3-2E is designed for protection against anti-tank mines with magnetic fuzes. It can be installed on any vehicle (tank, infantry fighting vehicles, armored personnel carriers, vehicles). The complex distorts the magnetic signature of the protected object, forcing mines operate outside the projection of the tank, or blocking their operation. Heavy BMP made ​​a strong impression on all, unique in the world, as I understand it, there is simply no. What are the prospects of development of its weapons? Now there is a complex with 30 mm cannon. Suggests a large-caliber options, in particular the module that was successfully demonstrated in Abu Dhabi? Of course, we are considering as an option for certain customer installation combat unit with high ballistics gun of 57 millimeters. And we fulfill this option. Cyberspec wrote: Gee collegeboy, that's a lot to chew on and I'm short on time today...basically the T-14's gun is more powerful than the Leopard's gun even though it's 60cm shorter and the new ammo has already passed tests and is in production...sounds good. The length of the gun is a lot less important than the chamber pressure. The 120 mm guns you are talking about have very low chamber pressure in comparison to even the oldest 125 mm guns.